The What: Arista Corporation has begun shipping the ADM-2121BP Remote KVM HDBaseT Display. Featuring integrated HDBaseT receiver and video scaler technology, the new ADM-2121BP is a singe-cable (Cat-6) solution that is suited for use as a remote computer terminal in a wide range of applications, including public display terminals such as membership sign-up stations or infotainment systems, as well as control terminals for manufacturing plants or production lines. The What Else: The Arista ADM-2121BP is a one-cable solution for KVM display connectivity—facilitating the convergent delivery of uncompressed high-definition video, Ethernet control, USB 2.0, and power over a single LAN (Cat-6 or above) cable. Cat-6 LAN cables feature a locking connector and can be field-terminated, minimizing both costs and complexity while allowing for easy system expansion. Used with the new ADM-2121BP, the result is an easy-to-install video terminal solution. The ADM-2121BP has a flush bezel design that is easy to clean for sanitary purposes. 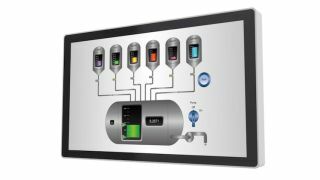 This makes for a KVM display that is suited for use in medical facilities, membership gym infotainment stations, and numerous other uses. Since the ADM-2121BP does not have ventilation holes, its dust-tie design is suited for manufacturing plants, production lines, and other harsh, dusty environments. The ADM-2121BP enables the computing platform to be separated from the front line and, thus, housed at a more secure and environmentally controlled location that is better suited to computer systems—resulting in easier maintenance and system upgrades.